Visiting and exploring Naples, Italy, and its surrounding area has, for centuries, been a must for those who want to increase their sense of culture and history. Since the fourteenth century the best minds of their times have searched the Naples area for the countless mythical places made ​​eternal by Lycophron, Virgil, Ovid, Horace, Statius, Suetonius, and Tacitus. And, indeed, traces of these fabled sites still remain to be seen and touched today. By the seventeenth century an ever increasing number of travelers from the rest of Italy and across Europe created an urgent need for an accurate and detailed 'guide' for tourists. Thus was born the tourist guidebook, with many editions written by well traveled scholars and ultimately translated into many languages. These early works remain valuable resources for scholars today. Beginning with the republican period of Rome and during the first centuries of the Empire, there developed along the Parthenopean coasts a series of splendid villas built by the elite Roman classes in search of the tranquility offered by the beauty of the area. One of these villas, called "Pausylipon" ("rest from troubles"), was on the sheer cliffs of a promontory overlooking the sea and coastline around Naples. This verdant, high headland was later named "Posillipo." This opulent estate, which has access through a tunnel called the "Seiano Grotto," belonged to a controversial political figure of the Age of Augustus: Vedius Pollio. This Roman gentleman died in 15 BC and willed his villa to Augustus, himself, who then undertook to expand the premises from Marechiaro to the Trentaremi caves. The complex was serviced by cisterns and aqueducts (there are, in fact, visible remains of ancient hydraulic structures along the route) and boasts of thermal baths, gardens, shrines, panoramic points, an odeon and a Greek theater. There is also a nearby "Red House" built in 1842 for Monsignor Camillo Di Petro, Apostolic nuncio at the Bourbon court, which was carrying out excavations in the area. There are many structures along the sea, including the famous "School of Virgil," so-called from the medieval legends that attributed to him magical as well as poetic powers. Tricliniums, shrines, porticoes, loges, (some submerged), make up the rich heritage of the underwater archaeological park of Gaiola, which takes its name from the small island off the promontory and which was identified with the ancient Parthenopean seat of Venus Euplea, patroness of the seafarer. In the midst of these groves of holm-oak one is taken with the unrestrained volcanic nature of the area; the cliffs of yellow tuff covered with artemisia, broom, wallflower, senecio and lentiscus open towards the sea in grand chambers steeped in mystery. The Naples city services allow visitors to the Seiano Grotto and the Archaeological Park of Pausylipon on weekdays at 9.30, 10.30 and 11.30 a.m. There is no fee, but reservations are required (tel. 081 2301030). Guided tours are also available on week-days, Sundays and holidays at 9.00, 10.30 and 12.30 AM; these are provided by the Gaiola Onlus Center for Interdisciplinary Studies. Reservations at required (tel. 081 2403235). The guided tours may include sections in sail-boats or glass-bottom boats, actual snorkeling or scuba, and excursions that combine both land and sea. 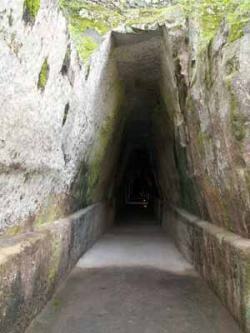 The tunnel named the "Grotto of Seiano" connects the Bagnoli area to the glen of Gaiola and is part of the route through the Pausylipon archaeological park. The great fifteenth-century Neapolitan humanist, Giovanni Pontano, confirms that the builder was one of Tiberius' well-known ministers, probably Lucius Auctus Cocceius, the Roman architect in the employment of Marcus Vipsanius Agrippa and the one who also planned the "Pace Grotto" or "Grotto of Cocceius" (the tunnel between Cuma and Lake Averno) and also the "Neapolitan Crypt" or "Posillipo Grotto" that leads from Mergellina to Fuorigrotta. As well, Cocceius may have been responsible for the "Roman Crypt" at the Cuma acropolis. The Grotto of Seiano is about 770 meters long and thanks to three lateral shafts along the south wall there is ample light and air. One of these may be visited and leads to a scenic observation point overlooking Punta Cavallo and Cala Trentaremi. This underground structure has a mixed history due primarily to the fact that part of it is dug within the crumbly form of earth known as pozzolana and, thus, has been subject to cave-ins at various times. It was restored in the 4th century AD (as attested to by an inscription found on the site); after the 16th century, however, the grotto disappeared from written records. It was rediscovered in 1826, and in 1840 King Ferdinand II of Bourbon ordered it rebuilt so that it might play a part in handling the great tourist flow that Naples has always attracted. That work was completed in 1841. The gallery was fitted with gigantic tuff arches (we counted 77) to brace the vault; these narrowed the passageway somewhat but also allowed the preservation of ancient Roman opus reticulatum brickwork of the wall surfaces. A small necropolis may be seen outside, where the tunnel looks out on the Gaiola glen; also, along the final eastern stretch of the north wall of the gallery there are some carved out niches containing devotional markings in the form of crosses. That spot is marked by a small marble base found during excavation. As with all Neapolitan tunnels and quarries, this one, too, provided shelter for the population as an air raid shelter during the bombardments of the Second World War. That is particularly in evidence in the second lateral shaft mentioned earlier. The easternmost part of the Sanità quarter is the area of the Fontanelle. Along the road of that name, there are numerous caves and quarries that until the last century long served as a supply of building stone for the entire city and today are used for a variety of purposes. At the end of the road stands the church of Maria Santissima del Carmine. This house of worship was built at the end of the eighteenth century at the entrance to a quarry used in olden times as an unauthorized cemetery, then as a paupers' cemetery, then as a burial site for victims of the plague and a deposit for skeletal remains from various sites throughout the city, including overflow from tombs within churches, themselves. 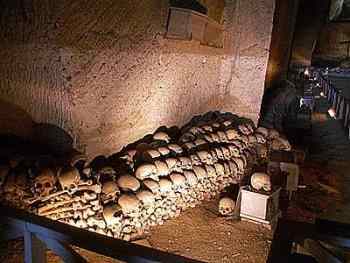 The origin of the ossuary probably goes back to the 17th century when the city of Naples was undergoing a particularly crucial period of revolution, famine, earthquakes, eruptions of Vesuvius, and epidemics. The space is divided into three large galleries called "naves." They are joined one to the other by lateral corridors. A number of openings allow for the passage of light, thus creating an evocative display of light and shadow. In the so-called "Priests' Nave," where you see a small stone chapel, you find skeletal remains displaced from within tombs in churches; the central section, called the "Nave of Plague Victims," is where remains were deposited of those who died in epidemics; the last nave, called "For the Poor" is where the remains were placed of those who had not been able to afford a church burial. In 1872, after a period of neglect during which time the contents of the space were allowed to lie scattered in disarray about the premises, the cemetery was entrusted to the care of don Gaetano Barbati who, with the help of the populace, put the remains in the well-tended order that one sees today. Thus began at the Fontanelle that peculiar cult dedicated to the souls of the poor, one which Neapolitans feel to be a duty. Devotees would flock daily from all over the city to the ossuary, "adopting" the anonymous deceased, caring for the remains and praying for the souls in order to ease the passage from Purgatory into Paradise, in return for which these souls, thus "refreshed", might grant favors of "grace" in return. The throng was such that at the end of the 1800s a special tram line was set up that would take a devotee to the cemetery for 15 cents. Via Fontanelle thus became lined with stalls for those selling candles, small figures of saints and rosaries, enabling many such merchants to make a living. This custom of "adopting" souls reached a crisis in the period following the Second World War and the subsequent years of uncertainty, when bones and skulls started to be encased in small shines of wood, glass or marble, many of which were built and sold in the immediate area. In 1969 Cardinal Corrado Ursi, the archbishop of Naples, worried that this turn of events had caused the phenomenon to, in his words, degenerate into fetishism, ordered the closure of the cemetery. Later, the ossuary was reopened for brief periods but then closed because of geological instability. Work was undertaken in 2002 to restore and stabilize the premises. That work was finished in 2006 but the site remained closed until 2010 when peaceful demonstrations by occupants of the Sanità finally convinced the municipal administration to give the Fontanelle Cemetery back to the city. Visiting hours: every day from 10 AM to 5 PM — Entrance is free. When they build a 92 km waterway to move water from the Acquaro springs of Serino, near the slopes of Vesuvius to Bacoli, a waterway with canals, shafts and bridges, you can be sure that the final target cistern for all that precious liquid will match in size, capacity and outright impressiveness all the work that has gone before to get the water to it. This rule is particularly evident in the case of the Augustean aqueduct (1st century AD). The entire structure passed through towns such as Nola, Acerra, Atella, Naples, Pozzuoli, Baia, Cuma and Miseno, yet was not aimed so much at supplying the general population with drinking water as it was at feeding the giant reservoir that served the Imperial Roman Fleet, the "Classis Praetoria Misenensis" based at Miseno. Tradition says that the reservoir has borne the name "Piscina Mirabilis" (Wondrous Pool) since the seventeenth century. The Roman obsession for construction is seen in the dimensions of this structure (15 meters high, 72 long and 25 wide, with a capacity of 12,600 cubic meters). It was the largest underground reservoir ever built by the Romans; 48 gigantic columns divide the space into 5 naves, lending somewhat of a cathedral-like or sacred appearance to the whole. At the center there is a decantation and waste tub that allowed for the periodic emptying and cleaning of the pool. Two long access ramps with stairs are at the NW and SE corners (currently, only the SE one is accessible); sky-lights in the vault filter the rays of the sun that illuminate and play along the thick layer of water-proof plaster on the walls and columns, creating particular effects of light making it a fascinating thing to see, definitely worth your time. Visits to the Piscina Mirabilis are by appointment. Closed Mondays. For further information contact Signora Immacolata Lucci at these numbers: 3336853278 or 3335720225 (not during lunch hour, 1:30 - 2:30 p.m.). Entrance is free. The monument complex of San Lorenzo Maggiore is one of the clearest examples of how the city of Naples has grown over the centuries, conserving in the ground beneath it memories of her rich history. Within the church, itself, is where Boccaccio met Fiametta in 1334; Petrarch lived in the monastery in 1346; and here is where the parliament of the kingdom convened. In the sixth century AD a paleo-Christian church was erected on the site of the ancient forum of the Greco-Roman city of Naples. Later, starting in 1270 the Franciscans built the current basilica with a single nave in the form of a Latin cross. Between the 17th and 18th century, the church was rebuilt along Baroque lines, which then disappeared in the restorations of the 19th and 20th century. Those restorations, however, excepted the facade, which had been rebuilt by Ferdinando Sanfelice in the 17th century, conserving the great 13th-century marble portal and original wooden doors. Beneath the church, convent and monastery, important remnants of the Greco-Roman and medieval city have been found and opened to the public. These include the "Macellum" (the public market) dated to the second half of the first century AD, located on top of Greek construction from the 4th century BC. You may walk down the restored street and see archaeological restoration of shops and businesses. In the monastic buildings, you may visit a museum which presents the entire history of the Basilica and adjacent premises. entrance to the Basilica is free. 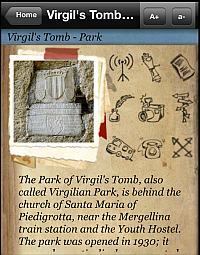 The Park of Virgil's Tomb, also called Virgilian Park, is behind the church of Santa Maria of Piedigrotta, near the Mergellina train station and the Youth Hostel. The park was opened in 1930; it was a dramatic display suggested by the scholar, Enrico Cocchia, hosting the Tomb of Virgil (a Roman columbarium from the Age of August that had been identified as the tomb of the poet); also present was the tomb of poet Giacomo Leopardi, whose earthly remains were moved to the site from the ancient church (now demolished) of San Vitale a Fuorigrotta; and then the famous Neapolitan Crypt (the ancient underground tunnel pathway built by the Romans to facilitate passage from Neapolis and Puteoli (Pozzuoli). This whole site was one of the most popular and frequent stops for well-educated, usually upper class visitors on the Grand Tour from 1660 to the 1840’s. The lake was known in ancient times as “Acherusia Palus”, the mythological swamp of Hades formed by the Acheron river. The lake is about 1.2 km² in surface area and is separated from the coast by a broad sandy swath covered with a thick growth of Mediterranean scrub. The connection with Hades is probably due to the presence of steamy, smoky fumaroles and thermal springs in the immediate area and at the bottom of the lake, itself. The water is connected to the sea by means of three man-made channels built at various times over the centuries. The oldest one (the Foce Vecchia—Old Outlet) is on the south and consists of a gallery dug into the tuff rock of the Torregaveta promontory and of a long channel behind that. The date of construction is a matter of some controversy; some place it at the time of the Romans, while others say the second half of the 1600s. Two other outlets from the lake to the sea stem from more recent times; the north outlet is from the Bourbon period (1859) and the "middle outlet" is from 1940. Even in pre-Greek times we presume that the lake was used by the indigenous Opici-Oscan population. They were situated on the Cuma promontory where they cultivated mussels; this could explain the rendering of that mollusk on the reverse of Cumaean coins. In 65-68 AD lake Fusaro became part of Nero's plan to create a navigable waterway (Fossa Neronis) that was to join the mouth of the Tiber river to Portus Julius. The term "Fusaro" (from "infusarium") is said to derive from the medieval use of the lake to soak hemp and flax. The area then became the site of a royal game preserve and in 1782 upon the order of Ferdinand IV of Bourbon, architect Carlo Vanvitelli built the Royal Hunting Lodge known as the "“Real Casina Vanvitelliana”. This enchanting ornate building is reached by a long connecting pier walkway and is the site of many local theatrical and festival events. Today the eastern bank of the lake is urbanized with countless private dwellings that encroach upon the shore, itself; the stretch along the south and west is marked by a footpath in a complete state of abandon. The ruins of Roman thermal baths, as well, are in the worst possible condition; they are called the "Grotte dell'Acqua" and are found along the eastern bank and incorporated in structures from the Bourbon period. The geothermal spring (40° C) that issues from one of the ancient Roman rooms was still used for therapeutic purposes from the 18th century until 1930/40. Currently, part of the lake in given over to the cultivation of the well-known Fusaro mussels, the prized ingredient in the traditional Neapolitan dish, “Spaghetti alle Vongole,” spaghetti and clams. Access is free and unregulated. To reach Pozzuoli from Naples there was one road called Antiniana, or the “via Puteolis Neapolim per colles” [hill road]. It, indeed, climbed the hills and was long and uncomfortable. Thus, in the first century BC a faster route between the two Roman cities was created by digging a tunnel through the Vomero hill, forming a direct connection between Mergellina and Fuorigrotta. The hill road and the "via per cryptam" (tunnel road) then joined up near what is today via Terracina. Strabo tells us that the Neapolitan Crypt (or Posillipo Grotto) was the work of architect Lucius Cocceius Auctus and was part of the general plan of road building to serve the military needs of Octavian and Agrippa. The Augustan Aqueduct ran parallel to the tunnel, moving water from the Serino springs to Miseno. Ancient sources describe the tunnel as low and narrow, but over time there have been a number of modifications; the tunnel is now 700 meters long, about 4.50 meters wide and between 5 and 20 meters in height. A Roman funerary monument can be seen near the eastern entrance; it is positioned higher than the ancient road bed and is identified as the tomb of Virgil. There was work to enlarge the tunnel during the reign of Alphonse of Aragon and then under the Spanish viceroys: the road bed was lowered considerably (11 meters!) and the dimensions of some sections were actually doubled. This brought with it considerable problems in terms of the geological stability of the whole structure. During one of these episodes of expansion a white marble bas-relief was discovered that depicted Mithras Tauroctonous, dated to the 3rd-4th century AD and is now conserved in the Naples Archaeological Museum. This has led to the hypothesis of the presence of a cult within the tunnel that was dedicated to the sun-god. Still near the eastern entrance of the gallery at about 11 meters above the walkway there are two 14th-century frescoes visible that were once part of the ancient chapel of S. Maria dell’Idria or Odigitria, a building demolished during expansion of the tunnel. The frescoes show Saint Luke (once thought to be a depiction of Christ Pantokrator) and farther along the shaft of the Augustean aqueduct there is a fresco of the Madonna and Child between two saints. The tunnel is currently being restored and may not be entered, although sections of it may be seen from outside. Increasing concern for the geological stability of the Neapolitan Crypt led to its definitive closure after the parallel "New Grotto" tunnel, today known as the "Galleria Quattro Giornate" was finished in 1885 and is a main traffic artery connecting two major parts of Naples. Lake Fusaro, the mythological “Acherusia Palus,” located northwest of the town of Bacoli, is connected to the sea by three outlets: the northernmost one goes back to the period of the Bourbons (1859), the central one is from 1940, and the controversial Old Outlet is at the Torregaveta promontory. That one is a 125 meter gallery dug into the tuff rock; it is 4.30 meters wide and about 6-8 meters high, lying 2.5 meters beneath the surface. Archaeologists tell us that it served as a kind of tunnel-road joining the landing and the inland property belonging to Publius Servilius Vatia Isauricus. Ruins are still visible at the promontory and the date of construction has been estimated to be in the first century BC or, at the latest, during the age of Augustus. Andrea de Jorio identified the tunnel in question with the famous chamber guarded by Cerebrus, a mythical three-headed dog with a serpent's tail, a mane of snakes, and a lion's claws. 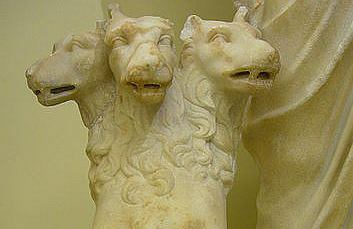 The ferocious three-headed hound was described in Virgils's Aeneid. Since then, the channel has been called "The Grotto of Cerberus." The general idea has always been to identify the chamber with Roman times, but a contrary opinion comes from architect Antonio Niccolini, whose archival research led him to conclude that the gallery was, in fact, built in the second half of the 1600s when the fathers of the Casa Santa of the Annunziata in Naples had concession of the property and decided to improve it by opening an outlet to the sea to let fish into the lake. That work seems to have been completed in 1696. Indeed, some submerged structures from the days of ancient Rome were cut in two by the digging. Traces of plaster are still to be found on the tunnel vault, a substance used by the Romans to line the gallery. It is probably the case that the chamber, born as a pedestrian passage, was then modified in more recent times by lowering the walkway, thus creating the channel. On the sides of the entrance west of the chamber there are still some horizontal openings leading to bunkers used in the last world war. Entrance is free and unregulated. (east entrance) near the terminus of the S.E.P.S.A. train line. In 1782 at the behest of Ferdinand IV of Bourbon a delightful, ornate lodge was built on the shores of Lake Fusaro, already the grounds for royal hunting and fishing. The lodge then became the guest house for illustrious visitors. The building is in the rococo style and was built to the plans of Carlo Vanvitelli while the decorations were the work of the noted landscape painter, Philipp Jacob Hackert. The building, designed as three intersecting octagons, has two stories and is built on an island joined to the shore by an arched wooden bridge. On the ground floor, the central circular hall displays a green marble Baroque mantelpiece of considerable artistic merit. Its twin—once situated on the opposite side of the hall—was removed during World War II. As well, the antique floor of floral design in the circular hall of the piano nobile was removed during that same conflict, and nothing remains of the frescoed vault done to themes of the hunt, of fishing and of nature, in general. The walls display four large paintings by Hackert (The Four Seasons), showing the panorama seen through the windows. The lines of the horizon in the paintings are such that they are continuations of the real horizon seen through the windows. These works disappeared during the political unrest of 1799. Reproductions made from drafts were put in their place in 2001. On either side of the corridor that leads from the hall there are two small spaces with frescoed vaults. The one on the left has a small display that preserves original fragments of the floor of the original royal building. 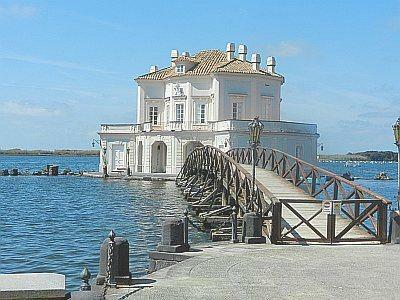 In 1817 there arose on the shore of the lake, directly in front of the royal lodge, a villa called "Ostrichina." The person responsible for the project was the court architect, Antonio de Simone. The new building was the result of the need for a comfortable place to dine. Access to the historical gardens of the Ostrichina is marked by two symmetrical buildings built on a single level called "Stalloni." Sundays from 10:a.m.-1:p.m. and 4-7:30 p.m.
Lake Averno is in an ancient crater formed four-thousand years ago; the steep walls enclose the lake tightly except for the part that faces the sea. Greek settlers of the area thought they recognized this area to be the fantastic sites described by Homer in Book 11 of The Odyssey: here is where Ulysses called upon the dead in order to learn his destiny, and here was the legendary Cimmerian city that never saw the light of day. The still waters of the lake are surrounded by impenetrable woods, and thermal springs issue forth from the banks; it was the ideal site for the kingdom of Pluto. According to tradition "Averno" comes from the Greek aornos (without birds). Indeed, legend says that fowl could not fly over these mysterious waters and survive the poisonous vapors arising from the lake. The Greek geographer, Strabo, cites Ephor and tells us that the mythical inhabitants, the Cimmerians, lived near the lake in underground houses called argils joined one to the other by a labyrinth of tunnels. 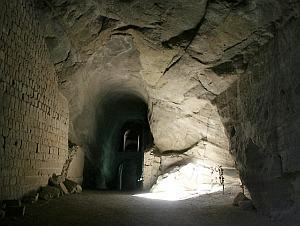 The Cimmerians had an underground sanctuary, and lived from working their mines and by making offerings to their Oracle. Neither the subterranean city, however, nor the sanctuary has ever been found. Roman general, Marcus Vipsanius Agrippa (63 BC – 12 AD) scorned the sacred nature of the area and cut down the forest that was supposedly dear to the gods of the underworld. The war between Octavian and Sextus Pompey was going on and Lake Averno, joined by a navigable canal to the nearby "Portus Iulius" of Lake Lucrino, became the ideal site for the Roman naval shipyards. As a result of the eruption of 1538 that created Monte Nuovo, the youngest European volcano, that canal disappeared. 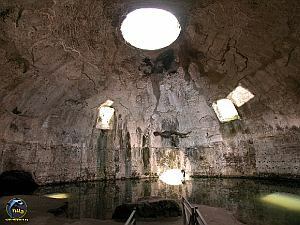 Agrippa also built a tunnel, the famous "Pseudo-Grotto of the Sibyl," to connect lakes Averno and Lucrino, as well as another tunnel, the work of the architect, Cucceius, to connect Lake Averno to Cuma. That structure is called the Grotto of Cucceius or Pace—"Peace." Lake Lucrino, however, really entered our collective imagination not because of such changes wrought by the Roman general, but rather through the work of Virgil. Book 6 of the Aeneid tells of the Trojan hero's journey to the Underworld in the company of the mysterious Sibyl, and even today these sites are steeped in that aura of mystery. You can still see and admire the so-called "Temple of Apollo" on the shore of the lake; in reality it is a grand ruin of what was once an ancient thermal bath complex. You will also find the ruins of the so-called "Shipyards of Agrippa" partially hidden amid vegetation and modern construction. In spite of the myth, the lake today, indeed, hosts a variety of fowl that you can observe from bird-watching cabins. The reedy swamp provides nesting for coots, water-hens, cormorants, grebes and other water-fowl. Kestrels, buzzards and peregrine falcons fly above the lake, and the presence of various kinds of owls recalls the sad fate of Ascalaphus, son of the Avernal nymph, Orphne, and Acheron. He was transformed into an owl by the queen of Erebus. On the eastern shore of Lake Averno, you see the ruins of a large Roman building dated to the second century AD; it, in turn, rests on the site of an earlier thermal bath complex from the beginning of the first century AD. The large chamber is octagonal on the outside and circular within, measuring 37 meters in diameter. It is thus the largest Roman hall with vault and dome except of the Pantheon in Rome, which is larger by only 5 meters. 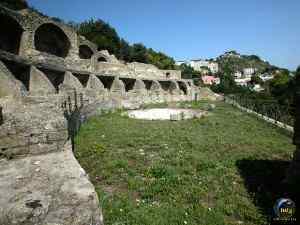 The structure, which recalls the large thermal bath chambers of Baia, was built on two floors and must have also contained a large circular bathing tub that held the waters from the lake or nearby natural springs, all of which disappeared in the eruption of Monte Nuovo in 1538. There is a semicircular corridor behind the hall with a wall facing the mountain; that wall is perforated probably in order to allow geothermal fumarole vapors that had built up from the underground source to vent and escape. Later humanist traditions are also popular. 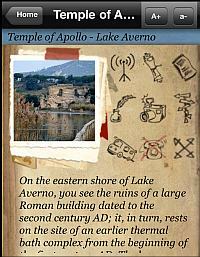 They conveniently associated Lake Averno with the Grotto of the Sibyl and then revised history, naming the ruins of this giant Roman bath at the edge of the lake the Temple of Apollo described by Virgil. Along the western shore of Lake Averno there is a small path sheltered by overhanging vegetation; the path leads to a cave that in ancient times passed through the Monte della Ginestra (the Broom plant). At one time, the entrance must have been larger. The tunnel is 3.7 – 3.8 meters wide and about 4 meters high at the shallowest sections. The underground section currently terminates just beyond a "well of light" after a perfectly straight 200 meter path running east to west. Here is where popular legend places the chamber of the priestess of Apollo, but in reality the structure is one of those galleries built by the Romans when Lake Averno was used as a secure anchorage for the Imperial Roman fleet. That would, thus, make it part of an interconnected system of roads and passage-ways that joined Lake Averno with the sea on the one side and the city of Cuma (through the Grotto of Cocceius tunnel) on the other. Along the route you can still make out images carved into the rock: a palm tree similar to the one in the Roman Crypt, a fish and a cross. Lorenzo Palatino claims that this is the gallery described by Petronius in the Satyricon and dedicated to the god, Priapus. He draws this conclusion from the graven phallic symbol on the vault towards the end of the passageway. Also noteworthy are the rooms and shafts, partially flooded by hot water along the right-hand wall at about the halfway point and again at the end of the gallery. The rooms, placed at a lower level, are reached through two openings in the wall and then by stairs cut into the rock; below the current water level you can see two pools and a bed made of brick. They were built in the Middle Ages, when the area was already underground; these spaces were used as thermal baths. It may be that the structure is the "balneum cryptae palumbariae" described by Peter of Eboli in the 13th century. Local tradition holds that the site contains the ritual cleansing font of the oracle Sibyl mentioned by Pseudo-Justin. The gallery was built in the year 37 BC by the architect Lucius Cocceius Auctus at the behest of Roman consul, Marcus Vipsanius Agrippa. It was part of the entire military complex of roads that joined lakes Averno and Lucrino (Portus Iulius) to the sea and to the city of Cuma. The tunnel is perfectly straight and is about 1.5 kilometers long; it is illuminated by six shafts, the deepest of which is over 30 meters long. They surface on the overlying hill, Monte Grillo. There is also a water channel running parallel to the gallery; it is equipped with ventilation shafts. The channel supplied water to reserve cisterns in the service of the Roman military fleet. At about the spot of the third light shaft, coming in from the western entrance, there is another branch of the gallery. It is still buried and has not yet been explored, but it seems to lead up towards the top of the hill. Strabo tells us that Cocceius took his inspiration for the tunnel from the Cimmerian tradition of walking beneath the ground. The mythical people, inhabitants of this area, lived in subterranean dwellings called argillae and tended to an important oracle of the dead near Lake Averno. According to some, this led Virgil, who certainly knew of the tunnel, to make it part of the Trojan hero's path on his journey to reach Hades. The tunnel was also called "The Grotto of Pace" or Tunnel of Peace. Historians in the 1500s derived that from the name of a Spanish cavalier, Pietro di Pace, who spent his entire fortune in search of a fantastic treasure said to have been buried within Mount Grillo through necromancy and magic. They claimed that the grotto was the result of his vain quest. 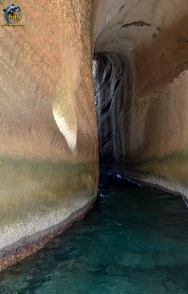 Due to the phenomenon of bradiseisms, or earthquake movements thrusting the ground upwards or downwards, the tunnel has often been flooded by the waters of Lake Averno that combine with rain run-off from the steep slopes, also causing frequent mud-slides. The gallery gradually fell into disuse, but was restored during the last years of Bourbon rule. It was later used as a munitions deposit by the Germans during the Second World War at which time the munitions accidentally exploded and caused a partial collapse of the tunnel. Recent restoration (2007/2008) was financed through a project of the European Union (POR 2000/2006) and was aimed at restoring the entire structure, but the gallery is currently closed and may not be visited. Urbanization of the Flegrean Fields, so named for the active volcanic activity in the whole area, meaning “Burning Fields,” preceded that of the city of Naples, itself. For many centuries the Flegrean Fields dominated both in wealth and importance. Greek and then Roman settlers populated these sites that were well-known for mild climate, fertile soil and thermal waters. The entire area has always been heavily urbanized; it is thus easy to come across archaeological remains mixed into the modern urban fabric, letting you marvel at antiquity while modern daily life goes on around you. 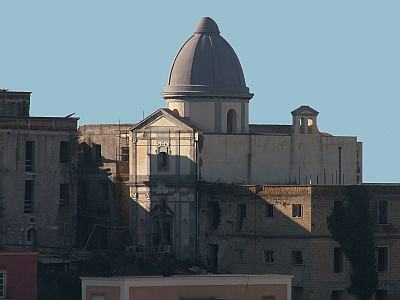 The "Roman necropolis of Cappella" fits into this scheme, located, as it is, in the Cappella area on the slopes of Monte di Procida. The original funerary structure was a mausoleum dated to the late republican period (the end of the 2nd and beginning of the 1st century BC). In addition to an underground chamber not yet properly investigated, there are four other funeral chambers that collectively form a rectangle; they can be traced to the first Imperial period (1st century AD). These chambers are done in Roman opus reticulatum brick-work with barrel vault; they were along the road and thus easily accessible. At the front wall of these chambers there is a shrine mounted with a pediment and a half-vault decorated in stucco to represent a shell. On all the walls there are carved out niches (columbaria) in the walls that preserved the ashes of the deceased. There are frescoes beneath the vault in two of these chambers. One represents Isis/Selene, and in the other there is a figure of a dancing maenad (female follower of Dionysus) shown holding a thyrus—a staff—and a cup of wine. Isis and Dionysus were two mysterious divinities; their cult required initiation rites and believed in resurrection after death. Both of these particular manifestations of faith were quite in fashion in military circles in those times. Indeed, some inscriptions found during excavations indicate the remains of a number of sailors from the imperial Roman fleet at Miseno and furnish interesting details. For example, one of the inscriptions bears a dedication by Lucio Vibio Valente, an officer aboard the trireme Capricorn, to the ordinary seaman Virtus Tiberio Claudio Phoebo, originally from Asia Minor, a man who lived 30 years, 14 of them with the fleet at Miseno. 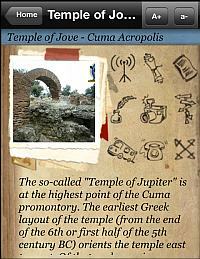 The so-called "Temple of Jupiter" is at the highest point of the Cuma promontory. The earliest Greek layout of the temple (from the end of the 6th or first half of the 5th century BC) orients the temple east to west. Of that early version, however, there remain only the tuff sandstone blocks at the base. The Roman temple from the age of Augustus was built atop those remnants. The long and narrow chamber is in opus reticulatum brick-work. Traces of the floor done in what is called opus signinum are still visible between some of the columns. It is not at all clear which god the temple was dedicated to. Its position at the highest point of the acropolis led many to believe that it was, indeed, a temple of the father of the gods. The colony of Cuma, however, did not count Jupiter among its native gods; thus, the most plausible candidates are Demeter or even Apollo. Between the 5th and 4th century AD the temple was converted into a Christian basilica with five naves. The baptismal fount is more or less intact; it is circular, lined with marble tiles and has three steps within the fount, itself. The fount draws water from a cistern along the south nave. Over time, the basilica was modified; some spaces were closed in order to build a chapel. The church then became the Cuma cathedral, as attested to by a funerary inscription that has been found. The church was dedicated to the martyred saints Massimo and Giuliana and contains the mortal remains of those saints. When the city was destroyed in 1207, those remains were removed to Naples. 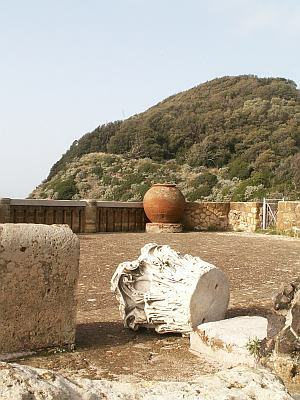 The park is part of the ArteCard Circuit of the Campi Flegrei. Hours: Every day from 9.00 A.M. until 6:20 p.m.
Closed: Jan 1, May 1 and Dec. 25. Tickets are available at the Archaeological Museum of the Campi Flegrei, the Flavian Amphitheater in Pozzuoli and the Archaeological Site of Baia. Tickets are valid for two days. Full-price tickets cost 4 euros; reduced (ages 18-25) 2 euros. Admission is free (below 18 years of age and over 65; applies only to Italian or European Union citizens. Cumulative ArteCard tickets are available. On your visit to Monte Nuovo or “New Mountain” as it is today, try to let your mind imagine living here back in 1538 when a totally flat landscape surged up and down and a 500-foot-tall mountain thrust upward ejecting smoke, ash and lava reaching its height in a matter of a few days. Today it remains Europe’s newest volcano! Early historians described the scene: “The "fields of fire," like the ancient gods that dwelt there, changed form constantly. Because of incessant movements of the earth, the sea, itself, periodically gained and lost ground. Thermal waters and sulfur spewed from the earth, and in every direction volcanoes awakened, their one fiery eye staring like Cyclops at the stars. Indeed, the fires made the earth especially rich and fertile. On the night of September 29, 1538, there was an important volcanic event. Though not the greatest the area had known, it reshaped part of the Flegrean Fields. There were eye-witnesses who recorded precisely what they saw such that today we are able to reconstruct the entire episode with some degree of accuracy. The eruption did not take the population by surprise as the area of Pozzuoli had been badly and continuously shaken by earthquakes during the previous two years. Chroniclers reported that on September 28, 1538 the sea withdrew "more than 200 paces" leaving a large number of fish on dry land. At the same time, the valley leading to Lake Averno, the ground between Monte Barbaro and the Monticello del Pericolo, started to swell. A day later a vast, horrific explosion of fire, stone, smoke, mud and ash forever buried the medieval village of Tripegole with all her ancient monuments to Roman greatness—the temples, the resort thermal springs mentioned by Peter of Eboli, the grand Roman thermal hall called "Truglio" and what had remained of the famous villa belonging to Cicero. The sea was covered to such an extent by pumice that the surface of the water looked like a solid field of earth; trees that were not uprooted were bent by the weight of the soft and heavy ash; birds and small animals died, and an earthen stench filled the air. Even parts of Calabria and Puglia felt some of the effects of this apocalyptic event, although true physical damage was limited to a radius of one kilometer. Pietro Giacomo da Toldedo records that the eruption stopped on the third day and that when the smoke had cleared the volcano was a splendid sight to see. This Neapolitan doctor and some others satisfied their curiosity by climbing the cone and looking down at the grand sight of a boiling caldera. In reality, the active eruptions had not yet finished (there would be four phases in all). Another eruption followed shortly thereafter and took the lives of 24 persons (the only victims of the entire episode), amateur Plinys trying to get their own close-up glimpse of this incredible phenomenon. Today, Monte Nuovo looks like just another innocent hill covered with Mediterranean scrub. It is no higher than 130 meters above sea-level; the diameter at the base is about one kilometer and about 400 meters around the rim of the crater, which is 80 meters deep. Monte Nuovo was declared a "nature oasis" in March of 1996. The walking trail is an interesting one: from the highest point of the rim you can admire the panorama of the entire Flegrean plain as well as the submerged relics of Portus Iulius near Lake Lucrino. At that spot on the rim there is even a circular brick construction, a leftover anti-aircraft installation from the Second World War. Along the path you will also see a small millstone dated to between the 17th and 18th century. On the southern slope there are hot vapors escaping from small holes in the earth. These are volcanic "fumaroles" connected to the still active volcanic geothermal activity that are “The Burning Fields” and testimony that Monte Nuovo is still alive. Hours: weekdays from 9 A.M. to one hour before sunset and from 9 A.M. until 1 P.M. on holidays. Tel. 081 8041462. Guided tours available upon request. The thermal complex on via Terracina is on university designated property behind the Mostra d'Oltremare (Overseas Fair Grounds). Construction of the massive entertainment and international exposition complex was begun 1939 as Mussolini was expanding his rule, and the Roman bath ruins was brought to light during the construction of the massive complex. 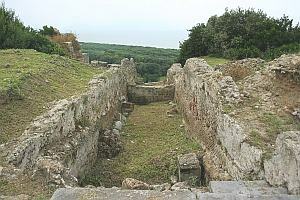 The baths were on several levels and fed by the Roman Serino aqueduct. The complex goes back to the first half of the second century and over time the complex underwent various modifications. Visitors to the baths could choose from among several offerings. The main one had various stops along the way: first the calidarium (for hot baths), then through a smaller chamber where baths of luke-warm water prepared the body for the colder water of the frigidarium. The rooms were richly decorated with mosaics depicting gods of the sea, dolphins, creatures of fantasy and human figures, as well; however, these decorations have come down to us in poor condition due to the continuous exposure of the complex to the elements. Some paving stones from the ancient roadway can be seen in back of the structure. The baths are not open to the public, but they are very visible through the wide steel fence along the public street, via Terracina. Cuma is one of the oldest Greek colonies in southern Italy, probably founded around the beginning of the 8th century BC. Settlers from Chalcis, Eretria (and possibly some from Kyme/Aeolis in Asia Minor), already on the nearby island of Ischia, decided to cross over to the solitary promontory and long beach protected by the dense thickets of evergreen oak and Mediterranean scrub known as Silva Gallinaria. The area was not uninhabited, however; there was an indigenous village already on that hill overlooking the sea. It is quite possible that the natives were already aware of their neighbors and quite unafraid at the sight of strange sails moving over the water towards them, preceded perhaps by the symbol of peace, a dove, released from one of the ships. The origins of Cuma are thus obscure, but between the 7th and 6th century BC that small settlement extended its dominion over the entire Flegrean region and became a true empire. It was not just politically and economically important, but was also of great religious importance as the ancient seat of the famed oracle, the Cumaean Sibyl, presided over by the god, Apollo, himself. Cuma defeated the Etruscans on three separate occasions but around 421 BC, succumbing to the Samnites, turned into an Osco-Sabellan city although it managed to retain Greek religion and traditions. The Roman conquest of 334 BC did produce new development in Cuma, but neighboring Puteoli was growing swiftly, and little by little Cuma faded into tranquility and silence. In the 4th and 5th centuries AD, her temples were transformed into Christian basilicas and as a fortified town now became the site of clashes between the Goths and Byzantines. In 915 Cuma was attacked by Saracens who saw in the site a good jumping-off point for further incursions into Puteoli and Naples. In 1207, Neapolitans destroyed this fortress town that had become a pirates' cove. With that, the thousand-year existence of Cuma came to an end. Her dark and mysterious chambers, the remnants of her temples and the scars of terrible battles all make Cuma one of the most evocative sites in the Flegrean Fields. At the foot of the promontory, amid silent planted fields, the low city spreads out, and the vast necropolis and giant entrance of the Arco Felice hold silent and motionless watch over that which is left of ancient and legendary splendor. 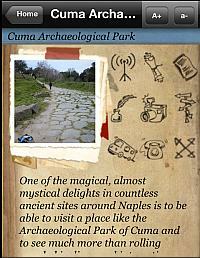 Now, as you visit and explore, look at Cuma a bit more closely and you will see it possibly come alive for you. 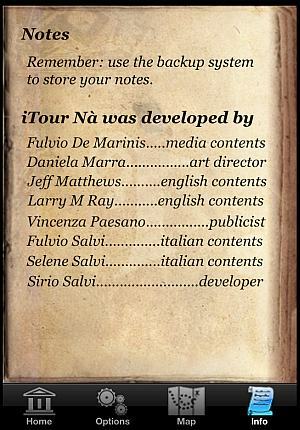 Check iTour Na index, above for “The Grotto of the Sibyl” too. In 1932 Amedeo Maiuri discovered a half-buried rectangular chamber dug entirely into tuff rock. On one wall he made out a trapezoid-shaped opening. For some years archaeologists had been scouring the area in search of traces that might lead to the discovery of the fabled Grotto of the Sibyl. This chamber, once freed of debris, seemed, indeed, to correspond to descriptions by various authors of antiquity: a long, straight trapezoidal corridor (dromos); it was 131.50 meters long and ended in a vaulted chamber with niches. It all looked like the chamber where the oracle priestess was said to speak her prophecies. In reality, from the position of the chamber and by analogy to similar structures throughout Magna Grecia, the space might also be interpreted as a defensive fortification from the second half of the 4th century BC. In that context, then, the chamber at the end might also be from the late imperial period. Along the main corridor three cisterns open on the left (east); they are fed by a channel that runs along the walls of the dromos; on the right, there is a succession of nine corridors of which six are open to the outside and thus provide light to the main gallery. Traces of burial within the cisterns and an arcosolium (arched recess) indicate that these spaces were used in the Christian era as catacombs. On one wall outside the grotto as well as in one of the lateral corridors, from more recent times, there are cuts in the rock surface that appear to be a "lunar calendar"; as well there is a spindle-shaped figure interpreted as a symbol of female fertility. Use your imagination as you visit this fascinating place. Listen carefully . . . .
Once again, this area of Cuma allows you to visualize an active and busy city developing around 700 BC as a new and important Greek colony. A little historical background helps bring it alive. The "Via Sacra" at Cuma leads to the lower terrace of the acropolis and the sanctuary of the Temple of Apollo (as attested to by an Oscan inscription found during excavations in 1912). Before the arrival of Greek settlers on the site there was already an indigenous hut village that must have existed there since the end of the 10th century BC. Only the rectangular base remains of the Greek or Samnite oracular temple (from the second half of the 5th century BC). It was probably had a single row of pillars on all sides in the style of the temples of ancient Greece. It was oriented north-south on the remains of an earlier temple of which some traces remain on the western side. During the age of Augustus the temple was completely rebuilt and oriented east-west. In 6th and 7th centuries AD it was transformed into a Christian basilica and again positioned north-south, and a number of graves were dug at the base. The holes dug along the entire foundation go back to the period of Saracen raids and were probably used to anchor tent pegs. Besides the temple on the terrace there are other structures that form part of the sanctuary, such as the so-called Greek cistern (an underground space dated to the 6th-5th century BC as well as the ruins of a small podium temple from the late-republican period and probably dedicated to Artemis. There are also medieval dwellings in the area that go back to between the sixth and ninth century. This impressive amphitheater is the third largest in Italy. Its two axes measure 149 and 116 meters, respectively, and it was capable of holding from 35,000 to 40,000 spectators. The start of construction has been placed during the reign of Vespasian (69-79 AD). 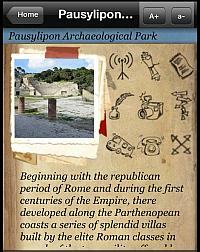 Construction was paid for by the population of the city of Pozzuoli to honor the emperor in return for his donations to the city for their having sided with him in his battle against Vitellius. After the splendor of the age of Rome, the amphitheater, stripped of its precious marble fittings, was abandoned and almost entirely buried by mud-slides from the higher elevations of the Solfatara hill. The first excavations were carried out in 1839 by noted architect Carlo Bonucci (also responsible for the excavations at Herculaneum) and then by architect Ruggiero who finished the clearing of the underground sections. The complete excavation of the site was finished at the end of WWII in 1946 and 1947. No other amphitheater of antiquity gives us as clear a picture of how the arena was set up for the devices used in the impressive Roman games. The grand underground spaces make it one of our most evocative monuments to the past: two straight corridors cross at the center and a third curved one traces the ellipse of the arena, itself; there are various connecting spaces symmetrically placed across from one another. The elliptical corridor is flanked by a series of low "cellae" or small chambers, set on two floors and having trap-doors that open to the arena. The small chambers on the upper floor held the cages of the wild animals used in the games. The cages would be hoisted through the trap-doors towards the outside letting the animals spring immediately from darkness into the bright-light of the arena with an effect that one can well imagine. Today the outside light filters through shafts in the arena and takes on soft shades to create a fascinating atmosphere as it plays along the columns and capitals once part of the external decorations but now still scattered where they were found since the first excavations. 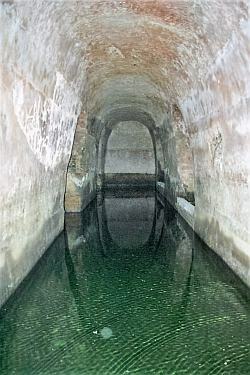 Below the walkway in the underground section, about four meters down, there is a channel from the ancient Campanian Aqueduct. Since the arena had no true underground chambers, this led some to believe that the water served to flood the arena for reenactments of naval battles, or "naumachies". In reality, however, it has been shown that the aqueduct served simply for the periodic cleaning of the underground sections of the amphitheater. This is a splendid site that you will certainly enjoy and remember. The Flavian Amphitheater may be visited every day but Tuesday from 9 AM until 6:p.m. The ticket office closes at 5 p.m. Tickets cost 4 euros, are valid for two days, grant access to the Archaeological Museum of the Campi Flegrei, the Archaeological Park of Cuma and the Archaeological Site of Cuma and may be purchased at any of those sites. 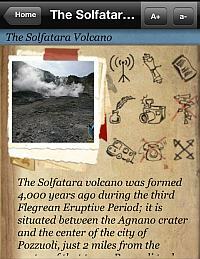 The Solfatara volcano was formed 4,000 years ago during the third Flegrean Eruptive Period; it is situated between the Agnano crater and the center of the city of Pozzuoli, just 2 miles from the center of that town. Pozzuoli took its name from Puteoli from the Latin putere (to stink), because of its proximity to the sulfuric smell from the ground level, constantly fuming Solfatara volcano. A recent discovery of a Roman necropolis from the first century has caused a revision of the claim that the volcano last erupted in 1198 since the tombs are located in layers of ash that go back to the very formation of the volcano and there are no further pyroclastic deposits on top of them. All we can really say is that since the birth of the volcano there has simply been active fumarole activity of varying degrees. The shallow volcano is at ground level and is surrounded by high sloping walls. It is elliptical and its main axes measure 770 and 550 meters. The crater contains: a lake of bubbling mud (la Fangaia), the fumarole called Bocca Grande (emitting vapors at about 160° C.), two old sauna baths (the Old Ovens) from the 1800s (called Inferno and Purgatory,) and an ancient trachyte quarry. The volcano was known in Roman times as the Forum of Vulcan/Hephaestus. From the middle ages to 1600 a well-frequented sulfur bath complex was located a short distance away; it was held to work wonders in cases of female infertility and many other maladies. In the 1700s and 1800s the Solfatara was one of the must-see stops on the aristocratic cultural itinerary known as the Grand Tour, and is still a don’t miss stop for modern day tourists. At the beginnings of the last century, renowned Neapolitan archaeologist, Amedeo Maiuri, earlier named head archaeologist for the excavations at Pompeii, began exploration, following clues from Greek and Latin literary and historical sources at Cuma, and succeeded in identifying the Grotto of the Sibyl at Cuma. In 1925 he thus began clearing away the debris from the spaces that ancient authors tell us to have been the seat of the mysterious prophetess. 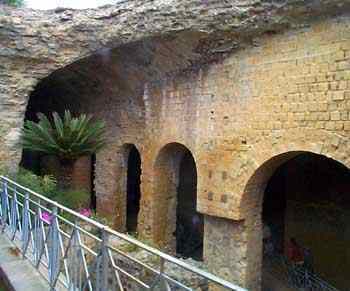 In reality, Maiuri brought to light a Roman tunnel that connected the Roman fleet’s port with the Forum of the city; it had probably been part of a grander military structure planned by Augustus to connect Portus Iulius (Lakes Lucrino and Averno) with the port of Cuma. The tunnel is dug entirely into the limestone bank at the base of the hill that hosts the acropolis of Cuma; it is oriented west-east and is 292.5 meters long. There have been cave-ins over time and various sections have been used as quarries; as well, there have been modifications and restorations. The north wall of the fore-court is done in opus vittatum (horizontal brick-work set in cement), and there are four large niches that must have held statuary. Maiuri dates this construction to the age of Augustus. The builders traced likenesses of their tools on the vault: pick-axes, hammers, wedges. The tunnel has undergone modifications at various times, particularly in the first century AD, when the west entrance was raised 2.30 meters, probably to deal with instability in the rock. After that, the gallery seems to have given up its primary function; lack of maintenance and various cave-ins resulted in being able to enter the tunnel only from the east and to move for a short distance along the length. The cemetery phase of the tunnel goes back to that time. Along the walls of the east entrance there are around 20 burial niches; as well, there are paleo-Christian markings cut into the tunnel walls. Two symbols, a crown and a palm tree, have been cut into the west wall near the entrance to two large cisterns; they were part of an underground chamber dug into the rock above the gallery. That chamber then collapsed into the tunnel, itself, but is thought to have been used jointly by Christians and non-Christians but later abandoned when pagan cults were forbidden and Christians took possession of the acropolis. Next to the entrance to two large cisterns, on the west walls can be seen graffiti depicting two symbols, a crown and a palm, part of a hypogean décor excavated from the soft tuff sandstone in the upper sides of the tunnel. Subsequent cave-ins eventually became cleared out and the chamber rediscovered and said to be ancient pre-Christian basilica. Others have claimed that the structure might be where St. Maximus was buried, said to be located along "the via Caballaria ibi videritis crucem," or “where you shall see the cross,” and whose remains were then moved to the basilica of that name built on the ruins of the so-called Temple of Jupiter at the top of the hill. Via Caballaria might correspond to the Roman Crypt and the cross to the one cut into the wall near the collapsed chamber. Near the same spot, on the south wall, there are two large cisterns with a capacity of c. 35,000 cubic meters; they are fed by conduits on the north side. Given the capacity of the cisterns, it is probable that the conduits in turn came from an aqueduct; we can infer that, because one stretch of the north side of the Cocceius Aqueduct contains just such an arrangement. At the end of the fifth century, the section of the tunnel past the entrance was shored up and reinforced. Unfortunately, the vault at the entrance collapsed, leading to the entire space being buried. The collapses go back to the Greek-Gothic wars of the sixth century and led to the eventual use of the gallery for quarrying. Two quarries may still be seen; one is on the north wall of the entrance (Maiuri thought it was a sky-light) and the other one is on the north side of the gallery across from the chamber called the Grotto of the Sybil; the latter one comes out beneath the Byzantine Tower near the so-called Temple of Apollo. Among the collapsed bits and pieces, Amedeo Maiuri found a marble statue of Diomedes stealing the Palladium from Troy. It is a Roman copy of a bronze original done in 430 BC by the Greek sculptor, Kresilas, and is today on exhibit at the National Archaeological Museum of Naples. Currently, the Roman Crypt in undergoing an extensive restoration and is not open to visitors. You can, however, from the entrance to the acropolis, look through an opening in the promontory and glimpse part of the fore-court (vestibule). Hours: Every day from 9.00 A.M. until until 6:20 p.m. Closed: Jan 1, May 1 and Dec. 25. 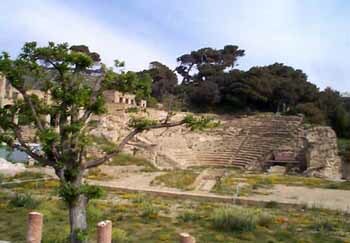 Tickets are available at the Archaeological Museum of the Campi Flegrei, the Flavian Amphitheater in Pozzuoli and the Archaeological Site of Baia. Tickets are valid for two days. Full-price tickets, 4 euros; reduced (ages 18-25) 2 euros. Admission is free (below 18 years of age and over 65; applies only to Italian or European Union citizens. Cumulative ArteCard tickets are available. 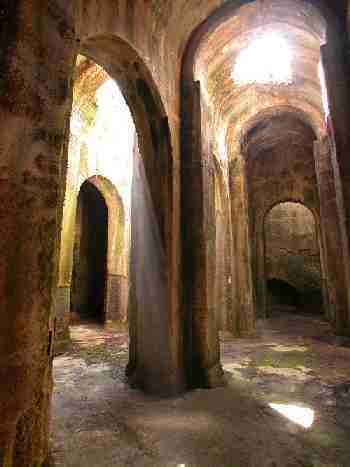 The Grotto of the Dragonara is an ancient Roman cistern and is in good condition. It is rectangular (59 X 50 meters) with the vault supported by 12 irregular columns that divide the space into 5 vertical galleries crossed by 4 horizontal ones, all with barrel vaults. It is dug entirely into the rock below cape Miseno and is datable to the first century AD. The inside is completely lined with waterproof mortar and the vault has three sky-lights with steps. Even today fresh spring water flows from a fountain in the entrance nave. Given a capacity of possibly more than 5,000 cubic meters of water, it isn't clear if the cistern served the needs of the Roman imperial fleet at Miseno or whether it was really for, as some erudite opinion in the 16th century claimed, the nearby elaborate structures of the villa of legendary Roman general and politician, Lucius Licinius Lucullus. As with other monuments in Naples and the surrounding area, this one, too, was on the refined cultural itinerary called The Grand Tour, which was actually part of one's cultural formation and education. Grand Tourists, indeed, often left traces of their visit. On the plaster you can still read the names of the painter Aniello Falcone (1600-1665) and of the French painter, Didier Barra (1590 - c.1650). A visit to the Roman “Happy Arch” is memorable because of the impressive size of this Roman Archway that fills a mountain pass. 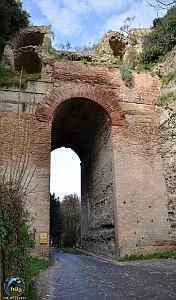 The Monte Grillo gap, or pass, was one of those works planned by the emperor Domitian in 95 AD as part of general construction of the Via Domiziana roadway to connect Rome and Naples and may be considered, as well, a monument portal providing access to the ancient Greek city of Cuma. Two sturdy cement sustaining walls were built in order to support the steep sides of the deep gap in the mountain. To connect one side with the other (perhaps at the request of property owners on the hill in what was then an intensely cultivated area), the supports were of cement, lined with brick and connected by means of a wall of similar construction with an internal passage and arched vault. The truly imposing structure is 20 meters high and 6 wide. The road that passes beneath the arch is paved with the original cobblestones and is still in use today. However, because it was constructed in Roman times, it is too narrow to allow two-way traffic, so traffic from each side must give way and yield until it is their turn pass through. Contrary to what is popularly believed, nothing has been found in the crumbles and missing spaces above and along the arch or in the walls on the hills on either side that would provide any evidence that the passage was ever used to convey water. Immediately on the right as you pass the arch there is a majestic entrance to an underground space. There are additional cavities on the left. The base of the arch still conserves the ancient Roman basalt. Farther into the valley on the left side of the road you can also see the Cuma-side entrance to the Grotto of Cocceius. The intricate building, also known as "Nero''s Prison," is dated to between the late republican age and the first century AD; it is considered the oldest example of a cistern system in the service of a private villa. The residence was the property of Quintus Hortensius Hortalus; it then passed to the wife of Drusus, Antonia Minor, and then to Nero. The Roman emperor hosted his mother, Agrippina, here just a few days before murdering her. The cistern consists of two distinct tanks, the walls of which are coated with cocciopesto, a mixture of mortar and ground potshards which provides a durable and water resistant lining. The two tanks were built at different times: the upper one is from the imperial age and is oriented N by NE to S by SW. It has four separate parallel corridors with barrel vaults connected by an arcade. The lower one, still has not been completely explored and is oriented E by NE to W by SW and has two parallel shafts each with small chambers that open on the sea. The facility is currently closed for restoration and geologic stabilization. 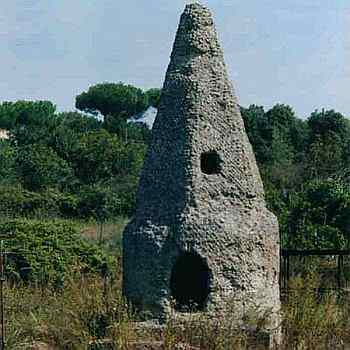 The Fèscina is a mausoleum from the Roman period which dates to the first century BC. It is most unusual and worth a visit just to be taken back to something from the first century BC still standing and in pretty good shape! It is all built in opus reticulatum the classic diamond oriented mortared brickwork utilized by ancient Romans. The mausoleum, or necropolis, has a pointed pyramidal hexagonal upper section which rests on a circular chamber. 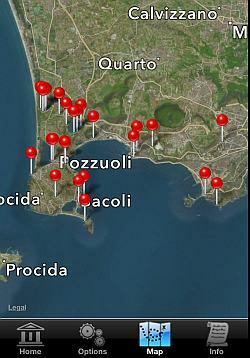 It is located in an open area and is easily accessible on via Brindisi in the Naples suburb of Quarto. This type of architecture is notable since it is the only one of its kind in the Flegrean or Campanian area; it was, however, widespread in the Hellenic Age across the eastern Mediterranean. The architectural prototype is the tomb of Mausolus at Halicarnassus, famed as one of the Seven Wonders of the Ancient World. The structure is built in the classic opus reticulatum brick-work and has two floors, one of which is underground and the plastered walls of which contain eleven niches meant to hold cremation urns. There are also three reclining couch-beds known as triclinia; they are of brick and were intended for ritual banquets. Two slit openings higher up allowed light and air to enter. Access is not regulated. The premises may be seen from outside, beyond the fence. Beyond any doubt, Baiai has the largest and most luxurious complex of thermal baths in antiquity. Along a 450-meter front, the entire hill from the "Baiai saddle" down to the sea is covered with the ruins of this imposing structure. Local tradition has given to some of the buildings in the complex names that indicate a religious function, but in reality they are all thermal pools and chambers. We can distinguish four main sections that dominate the complex: the Baths of the so-called Temple of Diana, the Baths of the so-called Temple of Mercury, the Bath-pool of Sosandra and the Baths of the so-called Temple of Venus. 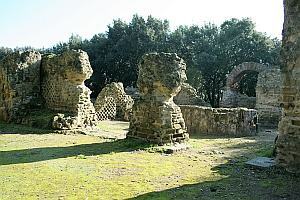 Those facilities were fed by thermal waters from underground mineral springs found everywhere in the area as well as by the Augustan aqueduct, which passed directly above on the hill on its way in to provide water to the massive Piscina Mirabilis cistern that served the imperial Roman fleet at Bacoli. Some of what can currently be seen of the installation was at a higher elevation in the past but then, because of seismic activity, sank to a lower elevation and the portion that was once at sea-level is now submerged. In 1962 R.F. Paget explored a narrow gallery in the upper section of the Baths of Venus; it had been dug back into the hill and was 350 meters long, ending in a square chamber. The scholar claimed to have discovered the famed underground temple of the Cimmerians: the Oracle of the dead. Archaeologists say, however, that the structure had no religious function but served merely to channel vapors issuing from the earth. Hours: from Tuesday through Sunday from 9 a.m. until 5:30 p.m. Tickets cost 4 euros and may be purchased at the Archaeological Museum of the Campi Flegrei, the Flavian Amphitheater in Pozzuoli, and the Archaeological Park of Cuma. From Tue through Fri entrance is free. Note: Tickets are also available at the Palazzina Ferretti at via Lucullo #94, the administartive office of the Underwater Park of Baia, which serves as a ticket office from 9:00 a.m. to one hour before sunset. Tickets are valid for two days. 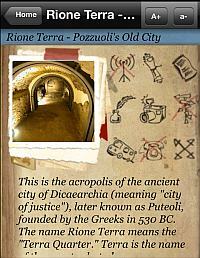 This is the acropolis of the ancient city of Dicaearchia (meaning "city of justice"), later known as Puteoli (today, Pozzuoli), founded by the Greeks in 530 BC. The name Rione Terra means the "Terra Quarter." Terra is the name of the quarter but also means 'earth' or 'land'. The area has been called that since the Middle Ages and was inhabited without interruption from its foundation until the year 1970, when a violent series of seismic events forced authorities to clear the area completely. Rebuilding and restoration was started in 1993 and during that work an ancient Roman city was found beneath the surface, complete with streets and shops. The Duomo (cathedral) was once a pagan temple, built by the noted architect Cocceius and dedicated to Augustus. It was built on the highest point of the promontory and, in turn, had been built on top of an earlier Greek or Samnite structure. You may visit the underground archaeological routes for free on Sat, Sun and holidays by booking ahead from Mon - Fri between 9:00 a.m. and noon at 081 19936286 or 081 19936287 or by going personally on Sat or Sun to the Infopoint in the Rione Terra from 9:00 a.m. - 5:00 p.m. This is an enormous circular building with four ample corridors at the base and with vault and dome, in the center of which there is a circular sky-light. Even if the architecture resembles the Pantheon in Rome, this building is, indeed, notably older. Construction goes back to the last years of the republican period or the beginning of the age of Augustus,147-30 BC. Even though the structure is universally known as the Temple of Mercury (or even the Temple of Echoes, due to the particular acoustical properties) it is really a thermal pool. The walls of the entire structure are in classic Roman opus reticulatum brick-work; the supports for the arches are ashlar (square hewn stone) and the vault is done in wedge-shaped stone displayed radially around the central eye. All of the stone used is tuff volcanic sandstone without the use of bricks or tiles. The building, like so many others in the area, has suffered the effects of the substantial upward and downward movement of the ground. These jiggling movements of the earth are called "bradiseisms", which in ages past have caused the partial burial of the premises from earth carried in by floodwaters. After the most recent uplift phase of the earth and the excavations in the first half of the last century, the structure is now almost entirely above ground. The pool contains a mixture of thermal and sea water and lets us imagine what its thermal bathing area must have looked like originally.